When the gold jewels of the Etruscans were first unearthed in the early 1800s, Fortunato Pio Castellani (1794-1865), the founder of the firm bearing his name, was present at the excavations as an advisor. Captivated by the beauty of the ancient techniques, he devoted many years to resuscitating the lost arts of granulation and filigree, finding the methods of the ancient goldsmiths to be infinitely more complicated and evasive than anticipated. 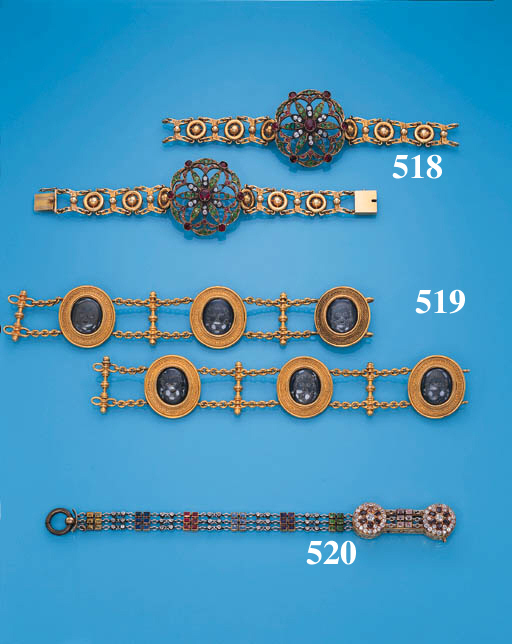 In his research on filigree, a technique incorporated in the present two bracelets, he studied the traditional methods of its creation by artisans in India, Malta and Genoa. Finally, he discovered a group of peasant craftspeople in St. Angelo in Vado, a small town in the Italian Marches, who had passed on the tradition of this type of goldsmithing since the time of the Etruscan civilisation. He brought them to Rome where they began to produce imitations of ancient jewels for the firm. The Castellani family is still considered today to have been the most gifted creators of archeological jewellery in the 19th Century. To find one of their pieces in perfect condition is rare, as they were often made with extremely fragile materials such as enamel or, as in this example, rock crystal. The six reverse intaglio masks in these two bracelets depict Graeco-Roman theatrical masks, including the images of Dionysos and Seilenos. The idea may have come from similar hardstone engravings by Benedetto Pistrucci, a premier Italian gem engraver from circa 1810-1850. The bracelets bear some similarities to a drawing for a jewel probably by Augusto Castellani, Fortunato Pio's second son, who took over the business when his father retired in 1861. The design, now in the Cooper-Hewitt Museum of New York, dates to circa 1861-62. It depicts a bracelet with similar bar spacers and two masks. According to Shirley Bury in "Jewellery: The International Era 1789-1910, Volume II 1862-1910" (Antique Collector's Club, London, 1991) the jeweller's mark, consisting of two addossed wirework C's, such as is apparent on these two bracelets, was "perhaps adopted for jewellery chosen for their exhibition début in Florence in 1861", rendering the bracelets quite important to the history of the firm. In any case, the mark differs from the double Cs applied on a stylised quatrefoil that later became their signature.